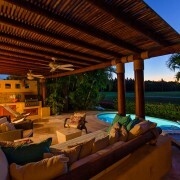 Located on 1 1/ 2 acre lot above Playa Rosa, in the heart of Costa Careyes, this spectacular five bedroom villa offers stunning south-oriented views and is in easy walking distance of the beach. Built in the traditional and famous architectural fashion of Costa Careyes, the home offers Mediterranean sensuality with the most unique selection of artisans and materials. Fully landscaped, the property features roof gardens and a fountain at the entrance. The master bedroom has its own living room, terrace and master bath with marble tub; all bedrooms have their own private bath. 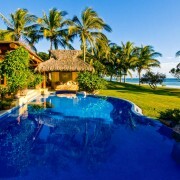 The wide infinity pool area includes lights, a heated Jacuzzi, sundeck, shower and a magnificent view. Casa Candelabros (The House of the Candelabra Cactus), named after the beautiful cactus that grow inside the house, takes advantage of the finest views, breezes and maximum seclusion. 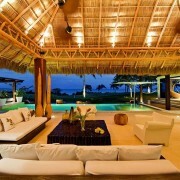 The residence encompasses a main living room with a traditional "palapa" and sweeping panoramic views of the coastline, a dining room with a lazy-Susan round table that seats 12. 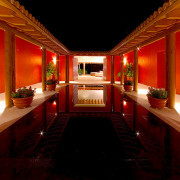 Casa Candelabros also offers a spectacular roof terrace overlooking the cascade, pool, Jacuzzi and ocean.